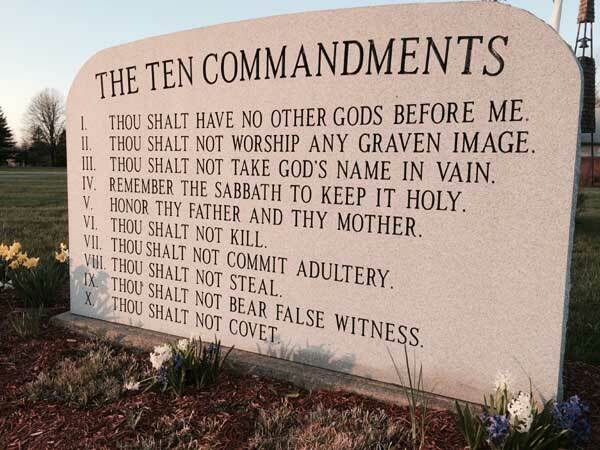 Is God's 10 Commandment Law Still Binding, Today - in 2019? "THINK not that I am come to destroy the law or the prophets; I am not come to destroy, but to fulfill." Matthew 5:17. What a contrast between the words of Christ, and the language of those who claim that he came to abrogate [abolish] the law of God [10 commandments] and to do away with the Old Testament. Our Saviour, who knew all things, understood the wiles of Satan, the snares by which he would seek to entrap the children of men, and so made this positive statement to meet the questioning doubts and the blind unbelief of all coming time. But there is a law which was abolished, which Christ "took out of the way, nailing it to his cross." Col. 2:14. Paul calls it "the law of commandments contained in ordinances." Eph. 2:15. This ceremonial law, given by God through Moses, with its sacrifices and ordinances, was to be binding upon the Hebrews until type met antitype in the death of Christ as the Lamb of God to take away the sin of the world. Then all the sacrificial offerings and services were to be abolished. Paul and the other apostles labored to show this, and resolutely withstood those Judaizing teachers who declared that Christians should observe the ceremonial law. Christ himself declares that he came not to destroy the law of ten precepts, which was spoken from Sinai. He says, "Verily I say unto you,"--making the assertion as emphatic as possible,--"Till heaven and earth pass, one jot or one tittle shall in no wise pass from the law till all be fulfilled." Matt. 5:18. Here he teaches not merely what the claims of God's law had been and were then, but that these claims should hold so long as the heavens and the earth remain. This testimony should forever settle the question. The law of God is as immutable as his throne. It will maintain its claims upon all mankind in all ages, unchanged by time or place or circumstances. The ritual system was of altogether a different character, and typified the death of Christ as a sacrifice for the broken precepts of the moral law. "I am not come to destroy," Christ says, "but to fulfill,"--"to magnify the law and make it honorable," as Isaiah, hundreds of years before, had prophesied respecting the Messiah's work. Matt. 5:17. "To fulfill the law." In his own life the Saviour gave the children of men an example of perfect obedience. In his teachings he made clear and distinct every precept of the divine law; he swept away the rubbish of erroneous tradition with which the Jews had encumbered it; he illustrated and enforced its principles, and showed in all its particulars the length and breadth and height and depth of the righteousness required by the law of God. The Pharisees were dissatisfied with the teachings of Christ. The practical godliness which he enjoined condemned them. They desired him to dwell upon the external observances of the ceremonial law, and the customs and traditions of the fathers. But Jesus taught the spiritual nature of the law and made clear its far reaching claims. Love to God and to men must live in the heart and control the life, as the spring of every thought and every action. There is perfect harmony between the law of God and the gospel of Jesus Christ. "I and my Father are one," says the great Teacher. John 10:30. The gospel is the good news of grace, or favor, by which man may be released from the condemnation of sin, and enabled to render acceptable obedience to the law. The gospel points to the moral code as a rule of life. That law, by its demands for undeviating obedience, is continually pointing the sinner to the gospel for pardon and peace. Says the great apostle, "Do we then make void the law through faith? God forbid. Yea, we establish the law." Rom. 3:31. And again he declares that the "law is holy, and the commandment holy, and just, and good." Rom. 7:12. Enjoining supreme love to God, and equal love to our fellow men, it is indispensable alike to human happiness and the glory of God. There are persons professing to be ministers of Christ, who declare with the utmost assurance that no man ever did or ever can keep the law of God. But, according to the Scriptures, Christ took upon himself our nature, "in all things it behoved him to be made like unto his brethren," and "was made in fashion as a man." Heb. 2:17; Phil. 2:8. He was man's example, man's representative, and he declares, "I have kept my Father's commandments." John 15:10. The beloved disciple urges that every follower of Christ "ought himself also so to walk even as he walked." 1 John 2:6. All who are in Christ will follow the example of Christ. All who justify the sinner in his transgression of God's law belong to that class of whom our Saviour said, "Whosoever therefore shall break one of these least commandments, and shall teach men so, he shall be called the least in the kingdom of Heaven." Matt. 5:19. They can have no part with Him who came to magnify the law and make it honorable. They are deceiving the people with their sophistry, saying to the sinner, "It shall be well with thee," when God has declared, "The soul that sinneth [transgresseth the law] it shall die." Ezek. 18:4. The words of Christ are both explicit and comprehensive. "Whosoever"-- minister or layman, wise or ignorant--"shall break one of these least commandments"--willfully or presumptuously, as did Adam and Eve--is included in the condemnation. Breaking one of the commandments makes man a commandment breaker. "Whosoever shall keep the whole law, and yet offend in one point, he is guilty of all." James 2:10. No excuse can avail for him who strictly obeys nine of the precepts of God's law, but ventures to break one because it is for his profit or convenience to do so. God demands implicit obedience to all his requirements. "And shall teach men so." This is a point worthy of careful consideration. Christ foresaw that men would not only break the commandments of God themselves, but would teach others to break them. Some are not content with doing this by example; they defend sin, and pervert the word of God to justify the transgressor. Such persons will have no part with the people of God. But the greatest guilt rests upon the professed watchmen, who do not hesitate to speak evil of the law, and even to make those who are ignorant of the Bible believe that they are fallen from grace if they keep it. "All we have to do," say they, "is to believe in Christ, come to Christ." The most fatal delusion of the Christian world in this generation is, that in pouring contempt on the law of God they think they are exalting Christ. What a position! It was God who spoke the law from Sinai. It was God who gave the law to Moses, engraven on tables of stone. It was Christs Father's law; and Christ says, "I and my Father are one." The Pharisees rejected Christ, but exalted the law. Faith in Christ must be accompanied by obedience to the law of God. While we point the sinner to Jesus as the one who can take away sin, we must explain to him what sin is, and show him that he can be saved from his sins, but not in them. He must be made to realize that "sin is the transgression of the law." 1 John 3:4. Paul makes the inquiry, many years after the death of Christ, "Is the law sin? God forbid. Nay, I had not known lust, except the law had said, Thou shalt not covet." Rom. 7:7. Thus Paul exalts the moral law. When this law is practically carried out in everyday life, it is found indeed to be the wisdom of God. It serves to detect sin. It discovers the defects in the moral character, and shows sin to be exceeding sinful, revealing it in all its hideousness. Through obedience to its requirements, Christian character is perfected. God's law is a copy of his mind and will. The sins forbidden there could never find a place in Heaven. It was love that prompted God to express his will in the ten precepts of the decalogue. Afterward he showed his love for man by sending prophets and teachers to explain and illustrate his holy law. God has given man a complete rule of life in his law. Obeyed, man shall live by it, through the merits of Christ. Transgressed, it has power to condemn. The law sends men to Christ, and Christ points them back to the law. The Signs of the Times - September 4, 1884.